Happy Wednesday! This time next week I will be finishing up my final work day of 2015...whoot!! I just wanted to pop in and share a few pictures that haven't made it into other posts. Ellie is very into dress up. In case you're wondering, this is how a princess sleeps. Ha! 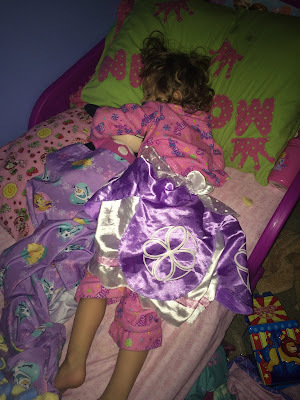 The other night, I walked into Ellie's rom to check on her before I went to bed, and this is what I saw. Bless her heart, she couldn't just got to bed. She had to wear her Sophia the First dress over her pajamas. Also, someone at work sent me this picture, and I bust out laughing every time I envision Eric doing this. Can you even imagine? Haha!! Eli is becoming a proficient little writer, which is proving to be a problem...BUSTED!! I promise that I cook too. Granted, it's not as good as Eric's. 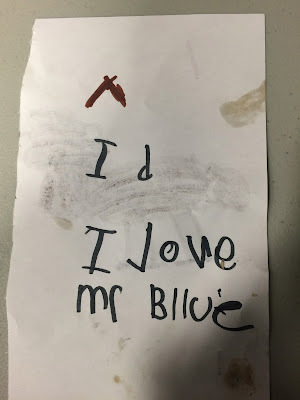 Also, please see below the unprompted letter to his teacher. She's a gem! Other than these photos, I haven't taken many pictures this week. Monday we stuffed baskets for our church's Angel Tree, and on Wednesday we delivered them. Eli helped and informed me that Jesus, God, Santa, and Daddy would be proud. Ha! Tomorrow night is basketball practice, and I have a work meeting that is supposed to be pretty lengthy. Friday we have plans to hang out with the Adkins, and then hopefully we'll wrap up our shopping on Saturday.